Think of the water in the ocean, or in a lake in the country. The waves move with the wind, sometimes gentle, sometimes fierce. These Splash Balis capture that movement with a cool collection of water-blue balis.Ranging from very dark to pale blue, this is the perfect collection for your colorwall. In addition to water, they’ll also be perfect to use for sky in your landscape quilts. 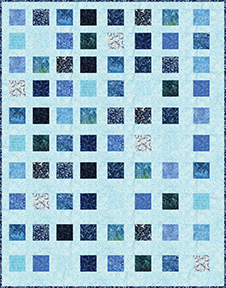 Or… mix them together and make a totally cool blue modern quilt. Quilt with blues!